There was to be 10 pounds of fiber to be spun, from local sheep, locally dyed and milled at Taylored Fibers. 10 pounds. That didn't quite hit home until I (a) injured my foot in July, leaving me only e-spinning as a wheel choice and (b) got a temp job 4 days a week in September, which is still steaming along with a somewhat indefinite future. Now, this 10 pounds isn't like the normal production run you might do for a sweater: not all the same color, to be spun up and bobbin-swapped as needed to make the singles come out consistently. Not at all. This is 8 ounces of each color -- and we decided to do them 4 ounces at a time, so she would have each color as quickly as possible, with the second half coming later. So, I have to spin 4 ounces, ply it, repeat until done. How can it hope to remain consistent? 1. Keep your sample card handy. Mine has actual Paternayan's (the source yarn to base everything on!) wound around it to see the twist angle in the ply, split into its singles and wound around it to see the diameter of the single, and fluffed out to see the fiber in the single. Every time I start a new color, and at random points as I spin that color, I compare back to that source yarn. At least once per ounce during the singles, and at the start of plying to make sure I have my rhythm right. 2. Focus. I don't drift off into conversations -- this fiber doesn't come with me to spin-ins, though the plying might, it's not as hard to get right. All spun at home. I've lost the thread of Stargate Atlantis entirely since I am paying more attention to the yarn than to the plot. 3. Use the same speed and tension each time. On my e-spinner, I set the dial the same; on my treadle wheel, I use the same ratio. And, I always back the brake band's tension off to soft-as-will-draw-on as I start each bobbin, since as the bobbin fills, the brake tension gets tightened bit-by-bit. Forget that, and the fiber yanks onto the flyer faster than I can say "boo!" 4. Use the same spinning style each time. 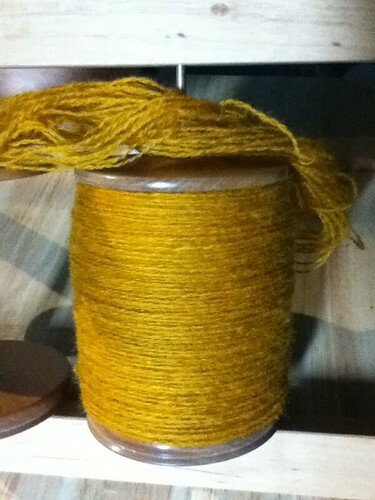 If you start out spinning worsted, spin it all worsted. If you start out spinning with double-drafting, spin it all that way. Whichever method you pick, stick with it. This yarn, I spin with double-drafting. It's production spinning, and that's my fastest way to get the yardage on the wheel. For plying, I have been using The Gentle Art of Plying as my plying method, but recently re-learned Alden Amos' plying method (see my youTube video embedded here; it is described in his Big Book of Handspinning ). 5. Measure and adjust. Not only do I work to stay on-task during the four ounces, but once it's done, I skein it up with a yardage meter (since I'm paid by the yard, it does double-duty). That tells me if I stayed in the target range. I should get about 100 yards an ounce. If it's too short, then it was too thick or too dense (spinning style - worsted is denser than woolen, or too much twist compacting it). If it's too long, then it was too thin or too airy (not enough twist will pouf out more in the plying). I make a note of the ones noticeably outside the target (over 10% off), and let the weaver know if a color might be a little thinner or thicker than the others, so she can compensate in the weaving. More than anything else, that sample card and staying on-task keep the yarn within bounds. The medium wool that I'm spinning -- some Border Leicester, some Jacob, some Romney -- all feels about the same, and all will spin into a slightly finer yarn than my target if my goal were fine spinning. Now, if all your fiber is the same color, you can spin a whole bunch of bobbins-full of singles, and then randomly pick from the singles to ply. That way, you can ply early singles by later singles or totally randomize, so your yarn diameter varies either as little as possible, or as randomly as possible. But I didn't have that option in this spinning journey. 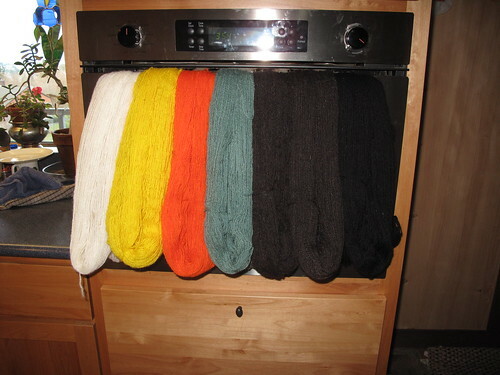 If you want to hear about spinning for a sweater's worth of fiber, Amy King has a great article on Knitty, Spin me a sweater! I just sent off the most recent 2 pounds to the tapestry weaver, shown here, bringing the total to 6 pounds, and got 2 more pounds to spin. All in all, it will be about a full year's journey to complete the 10 pounds. I have all sorts of luscious fibers lined up to treat myself with when my hands want a break from the medium wool. Pygora, Alpaca, Silk, and my own precious Llama -- all for laceweight. I'm thinking, though, I might want to dive into the stash for some wool/silk blend to spin into a thick single and tame with rough finishing, for a total change of pace. Or not -- 4-ply sock yarns are also on my spinning want-to's. So, how fun was Madrona? Wow. Franklin Habit's class on photography was eye-opening. I had a terrific time teaching a dozen or so folks the basics of spindling in the rotunda, did some stash enhancement to my silk weaving yarn at the Habu Textiles booth, picked up some lovely pencil roving from Crown Mountain Farms for learn to spin kits, and got to catch up with a variety of friends from hither and yon, including meeting several face to face for the first time. Syne, Sarah, Tasha, Anne-Marie, and many others -- however fleeting our hello's may have been, I always treasure meeting friends. And new friends, too -- Taryn, John, Selah, Judith W - how cool to meet you! If you didn't get to take one of my classes, there are e-books for all three of them on my website; Spinning Self-Striping Socks and the Mitts of Experience has always been fun to teach (see the review by kayak on ravelry for some hints why), and I'm pleased to announce two brand-new e-books for the other two classes, Power Spinning and the All That Yarn Scarf, and Silk on Spindles and the Lacey Vertical Rib Scarf. I hope you enjoy them! If you'd like to be on an email list for email announcements of upcoming workshops, let me know -- there are some fun ones coming up in March with Sheep & Socks as the theme. Absorb what is useful, discard what is useless, and add what is uniquely your own ~Bruce Lee. How cool is that. Exactly. I hope you, dear reader, use my blog exactly that way: learn the useful, forget the useless, and add your own ideas into the mix. Wow, thank you! That was really great information and I have bookmarked this post for future reference. You write the best posts! A boon when you're in New York City where there are no real classes. Dear Amelia, Thank you for your inspiration and these great hints! Consistency is an issue for me, because of my pain management, i may not spin or ply again for weeks. I have two questions, first I love your bobbin holder, what kind is it? It is at a great angle. secondly, can you please do a post about how to figure out the angle of a spun single ply? I just can't figure out how it is done. I'm planning to go through my wool shed & Dave what I love from my own sheep & have it processed the same way. There are also bits & pieces of my own process/spin adventure. Hats or mitts. I don't believe I've seen any videos on these topics. That's a good suggestion -- I've been hankering to do some new posts, and videos would be a fun way to do it.